1. Large scale public artworks such as sculpture, gates, seating & signage. 2. Smaller items I make myself, plaster casts, prints, clocks, trophies, cards etc. 3. Teaching art & craft based workshops to all ages & abilities. My current projects include this beautiful range of plaster cast plaques using plants, flowers & objects I find interesting. I am running workshops to show how to make them, if you are interested please contact me. I also have a series of new prints featuring flowers & plants. I will be running workshops on the following dates April 2019. Places are Limited to 4 people per session, see more details further down page. I run group or one to one sessions. Because of the available space in my workshop there will only be 4 people at each session, so you will get lots of help & advice. During the workshop you will be able to create two cast tiles. 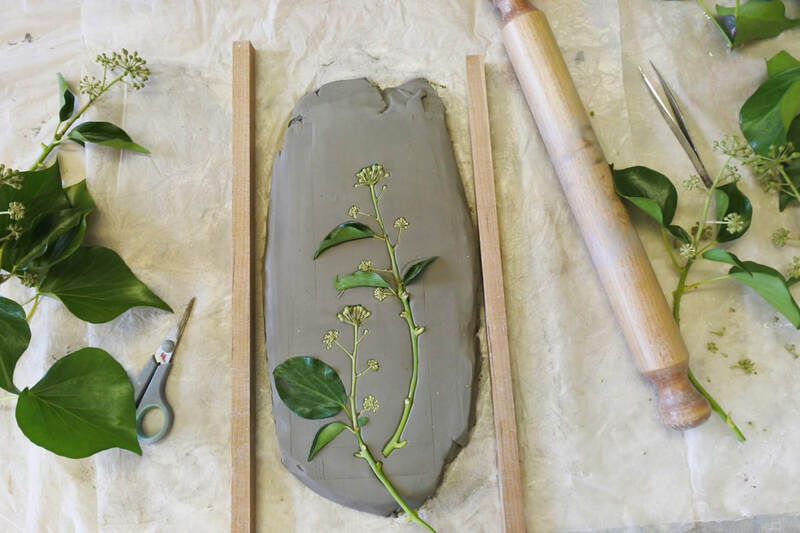 You will learn how to use a wooden frame, roll out the clay & arrange a selection of flowers / plants / foliage to create an interesting composition, I will bring these, although you are welcome to bring along your own flowers etc. if you like. You will also drill a small hole in the back for hanging. I will demonstrate how to smooth off the edges & clean the tile. At the end of the session you will be able to buy materials from me if you want to make more tiles at home. The cost of the group workshop is £65. This includes a deposit of £30, this is non refundable (unless I need to cancel or change dates & then it will be refunded), the balance needs to be paid 14 days before the workshop. You can pay via bank transfer, or if you pay through Pay Pal the cost will be £67.50 as they charge me for this service.